Springboks (South Africa), which represent the southern hemisphere rugby, won RWC 2007 after beating England (15-6). But no tries. By the way, this is how Habana is in training. I admit the fact that it's not easy to forget and accept the All Blacks lost. Until now. In the bus, on the street, in the city, I can see faces with all the regrets. For the last couple days, the city has not been as usual. It seems not so many people are going to work. Is it the national mourning period for NZ? 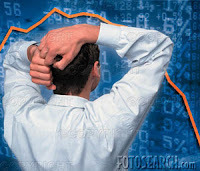 Does the national productivity really drop in response to the lost of the All Blacks as suggested before? To be honest, I'm not really a NZer but I had been following the 2004 RWC and am now the 2007. Since rugby is the national sport and the All Blacks team is the national icon, we eventually go along with them and the society in general. Assimilation I suppose. Since last month, we (I & her) have been trying to stay awake until late night or wake up early in the morning only for watching All Blacks matches in pool stage. I'm okay but I feel something's just not right. Cricket lost in semi-final from Sri Lanka, America's Cup lost in final from Swiss and now Rugby lost in quarter-final from France. Perhaps, Netball win in final can pay everything. In 2011, Kiwi will win all the games! God bless. All Blacks didn't go to semi final for the first time in the history. That's okay, the history doesn't stop now. It seems I'm okay with my basic rugby passing practice by now even just using Kezia's doll as the ball :) Now I'm ready to bet for the quarter final. No kidding, she will never permit me. I'd better sleep now for midnite going out with friends watching rugby at a sport bar (having a few stubbies of course). No I'm not serious, she won't permit me. I'll stay on the bed watching the match with her as she likes it eventually and leave the monday match for replay viewing. Okay, now the facts of NZ (All Blacks) vs France in Rugby World Cup history. 1. 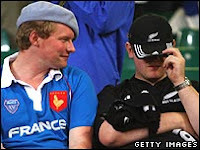 France beat the All Blacks once in the 99 semi final, but the All Blacks beat France many times. 2. 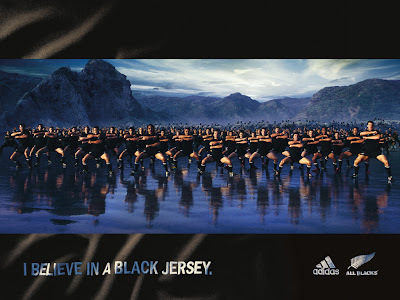 The All Blacks always went to semi final. 1. I don't really care actually at the moment. 2. Although England beat the Wallabies in the 2003 final, but until this moment England has shown very bad performance particularly got 0-36 vs the Springbroks (South Africa) in the pool stage. No tries from England but she won! first thing this weekend, just tidied up my blogroll in google reader. it's hard to read all of these at once. AndrewGarrett Half-Pie InnerGeek Kiwiblog NoRightTurn PublicAddress Salient Tumeke!